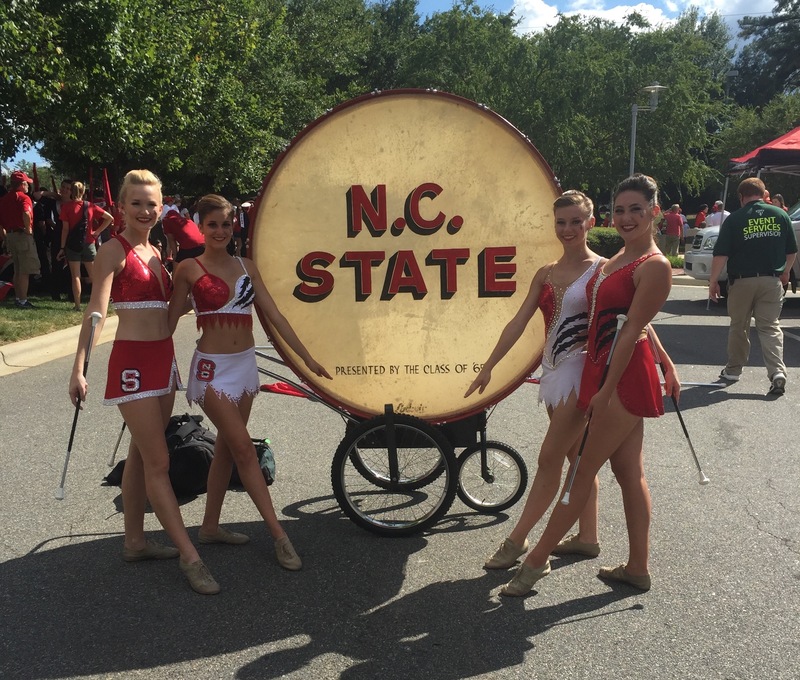 #TwirlerTuesday takes you to the lovely North Carolina to meet the Wolfpack Majorettes at NCState. While they all came from different twirling backgrounds, their love of NC State and twirling brings them together with a unique bond. 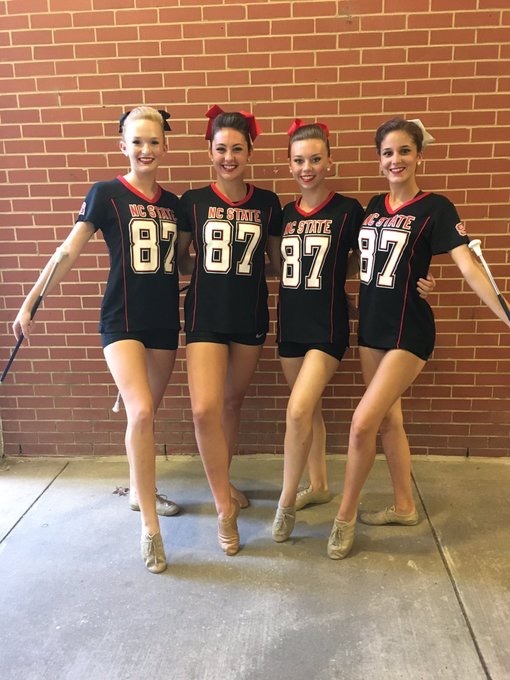 Read on and hear about what it is like to twirl at NC State and meet the ladies who wow the crowd there. As always, please reach out to us if you would like to be featured for an upcoming #TwirlerTuesday - cmbtwirl@sullivation.com. We are the Wolfpack Majorettes! The four of us are Feature Twirlers for North Carolina State University and are members of the Power Sound of the South Marching Band. We are very excited to be the first team of feature twirlers to be highlighted by College Marching Bands this season! We hope this article will tell you a bit about each of us as individuals and as a team! Go Pack! Erin: My name is Erin Noble and I am from New Market, MD. I am majoring in Zoology and planning to go onto a College of Veterinary Medicine after my undergraduate studies. I started twirling at the age of 5. I began with a simple ‘county class’ offered in my home town and it turned out that my good friend from preschool, Lexi Duda was there twirling along side my coach, her mom, Juli. I have stuck with baton twirling ever since and Lexi and I have truly grown-up together. CMB: What was it like coming on as the fourth twirler and being the only freshman? Erin: Being the only freshman on the team hasn’t really changed much for me personally. I don’t feel like much of a rookie when I’m with the girls, other than being teased when I ask a million questions or when I would forget what we would do next on game days, they include me as if I’ve been with them the whole time! From adjusting to college academics, to twirling at State and even introducing me to new friends these girls have reached out to me so much and I couldn’t be more thankful to be with them. I am so happy with the decision of continuing my academics here at NC State and for pursuing my dream of twirling with the Power Sound of the South in front of thousands of fans at the one and only Carter-Finley Stadium. CMB: What made you want to come to NC State? Erin: I have loved NC State ever since I step foot on the campus in the pouring down rain my sophomore year of high school. Not only is the campus beautiful and “bricked in tradition”, the entire campus atmosphere is entirely welcoming and warming. Since I have always grown up twirling with a team, the idea of being a feature twirler for a large university, but still keeping the team aspect that I have always cherished and loved was the best of both worlds in my eyes! It’s great to have the other girls with me all the time and add on to my twirling family and also to have the wonderful opportunity to each be featured in our own unique way. But of course, I came to college for an education and by wanting to pursue a career in Veterinary Medicine, NC State has some of the best undergraduate programs and networks to help me achieve my dream career...and of course the NC State College of Veterinary Medicine is right down the road! Oh and one last thing...Scotty McCreery? Yes, I am in love with him and yes I met him on my very first State visit that sophomore year. My teammates and coaches here are truly convinced that meeting Scotty on the field at Carter-Finley is the real reason why I chose State! I promise you it wasn’t...it just made my decision a little bit easier. Val: Hi! My name is Valerie Stevens and I’m from Richmond, VA. I recently switched my major from Middle Grades Education to Biology with a concentration in Human Biology. I became interested in twirling when I was in 3rd grade and found one of my mom's old batons around the house. I then learned that my mom had twirled for her high school and college and that’s when I knew I wanted to try it out. I then started taking classes from the Royalettes and was quickly hooked. 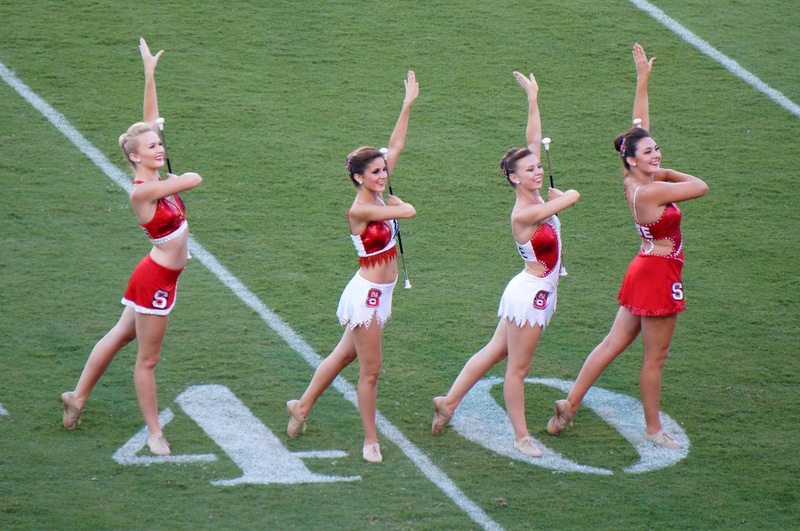 CMB: What has been your favorite memory as an NC State Feature Twirler? 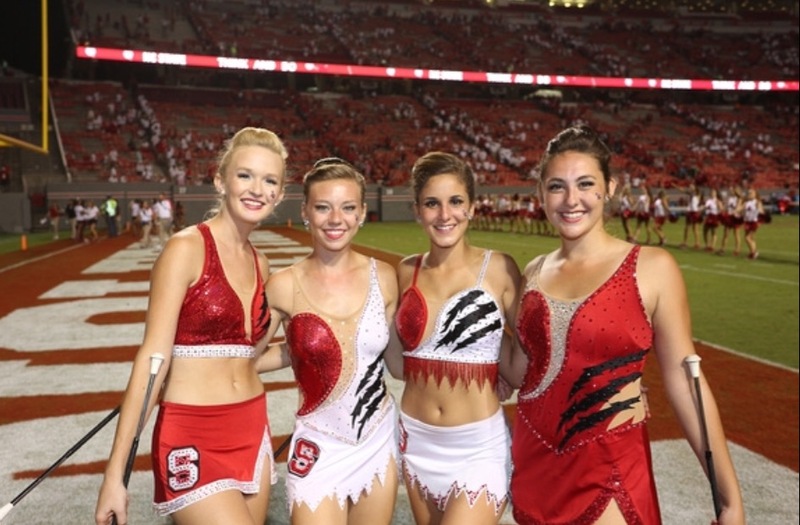 Val: My favorite memory as an NC State Feature Twirler is the very first game my freshman year. Not because it was the best show that we’ve done or because I had my best performance at that game, or anything like that, neither of those are true. It’s my favorite memory because it was my first time performing for almost 60,000 people and representing NC State. I knew I wanted to twirl in college for so long and on that day I was just in shock that I was finally doing that. After all the stress of try-outs and applying to colleges, and all the hard work and energy we all put in during band camp, it felt incredible to finally be in Carter-Finley Stadium and showing everyone what we had worked so hard towards. Val: There’s a ton great schools to go to and it can be really stressful trying to decide which one is best for you so it’s important to keep your options open and be yourself. At first I remember feeling anxious that I wasn’t applying to the same schools as all of my friends, but now I couldn’t be happier with the decision that I made, I found my home! Jaycie: Hi, my name is Jaycie Greenberg and I’m from Windham, NH. I am a business administration major with a concentration in marketing. I started baton as a 4th grader after seeing KeriAnn Lynch perform at a local Miss America competition. 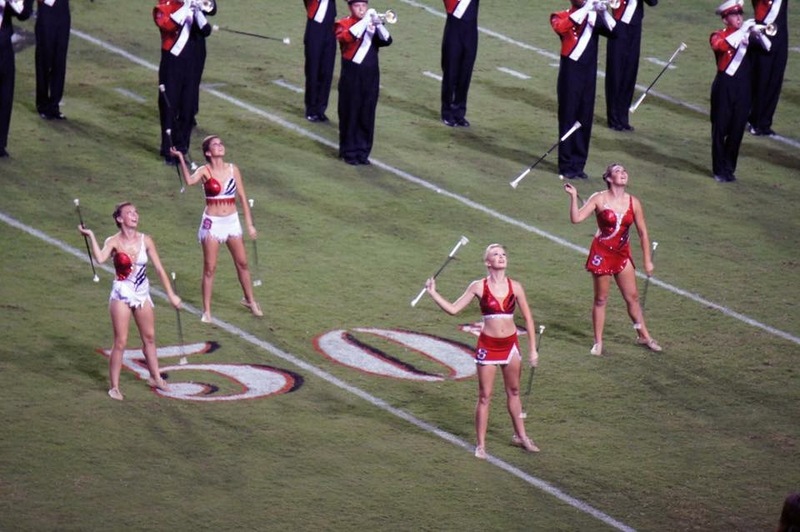 I twirled with the Red Star Twirlers of Derry, NH until I came to NC State and began my career as a college twirler. CMB: What is it like being in a program where you are on a team and also a feature? Jaycie: It is really wonderful to be a feature twirler in a program where I still get to work as a team and do performances all together. The bond I share with my fellow twirlers is very special to me and getting to spend time on the field and around the stadium twirling together is a special opportunity. We all also have a friendship that expands beyond twirling that has helped us all to push each other to be better students, twirlers, and advocates for college twirlers. CMB: What are you looking forward to this year as an NC State Feature twirler? Jaycie: I’m most excited for bringing new tricks to the field and showing off the hard work put in over the summer! We celebrated the 50th Anniversary of Carter Finley Stadium last weekend during the NC State vs. Notre Dame game and were able to twirl despite the ongoing hurricane. The fans that stuck out the wind and rain were so spirited and excited to see us twirl. Their excitement makes me want to throw harder and more intricate tricks every game! Olivia: Hi! My name is Olivia Kane and I am from Weston, MA. I am studying Communication with a Media concentration at NC State. My two aunts, mother, and older sister all twirled baton, so I was basically born with a baton in my hand! I’ve been competing since I was 5 years old. I took lessons from my Aunt Tracey with the Gangi Bay State Strutters all through my career and also am coached by Miss Bonnie Baxter. My whole life I’ve known that I wanted to be a feature twirler for a big university and that dream came true when I found NC State! CMB: When you take the field with your marching band, what is it like? Olivia: Taking the field with the Power Sound of the South is one of the most incredible and indescribable feelings. We are so lucky to have some of the greatest fans out there! Every game the fans fill up Carter-Finley Stadium to cheer on the Wolfpack. NC State is a school that takes traditions very seriously. One of those traditions is our pregame performance where the band plays our fight songs, alma mater, and the national anthem. As feature twirlers we are showcased at the beginning of pregame where we run through the entire band and leap over the 50 yard line and each do our “signature opening trick.” Another amazing moment during the game is when I head over to my fire batons and everyone realizes what’s about to happen and once the batons are lit, the crowd goes crazy! Olivia: It might sound cheesy, but my role model for most of my life has been my older sister, Alyssa Kane. Alyssa is nine years older than me so to me, she was my idol and the person I wanted to be when I grew up. She was the Feature Twirler for the University of Connecticut and since I was the little sister, I was at every single home game for all four years! I loved it because I knew that one day I would get to do the same thing as her and be a feature twirler. My mom, Elaine, also was the feature twirler at UConn when she attended the university not too long ago. Everyone thought I would follow in their footsteps, but four years of wearing 7 layers of clothes at those football games gave me some time to realize that I needed to go somewhere a little warmer! Thus I chose North Carolina State and found the Power Sound of the South, my family away from home!